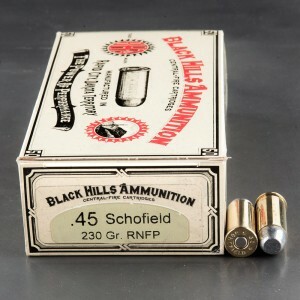 45 Schofield ammo is a round developed by Smith and Wesson in 1875 for use in their Number 3 top break revolver. The Schofield cartridge was developed on request of a Major Schofield of the U.S. Army’s 10th Cavalry. He requested one of Smith and Wesson’s new top break revolvers, and later made extensive changes to the weapon to fit the needs of the cavalry. Smith and Wesson’s new 45 caliber round was given the designation Schofield and was met with widespread acceptance, and an Army contract was awarded. 45 Schofield ammo is shorter than the famed 45 Colt and less powerful, but the Smith and Wesson revolver could be loaded twice as fast as the Colt. The 45 Schofield can be fired from 45 Colt revolvers, but due to the 45 Colt’s length it cannot be fired in Schofield revolvers. I've used this cowboy ammo at 25 yards using a S & W Schofield revolver. It is very accurate and recoil was mild. For some reason it was a little more accurate than the Black Hills brand. Well worth the price. Get some.